Unlike iTunes, Plex doesn’t make a copy of your media files and pull them into its own organized hierarchy, opting instead to let you control the folder structure of your media. 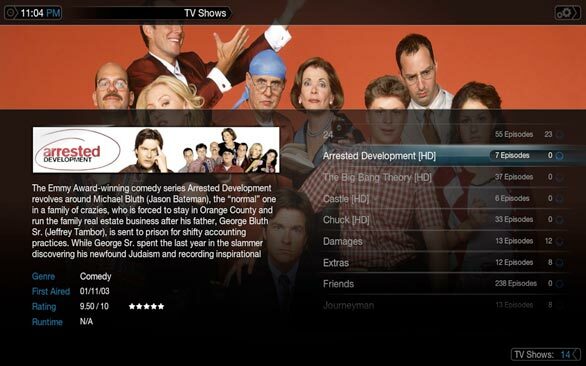 Once you have your movies and television shows organized and renamed by release dates for movies and seasons for television shows, all you have to do is point the application to the folders in question and it automatically pulls the relevant information about all your media from various online sources such as the Internet Movie Database, the Online TV Database, and MTV. Furthermore, it also automatically adds all the media files from your iTunes library to its own, allowing you to take advantage of iTunes’ superior music organization along with Plex’s strengths in the video department. Once you have your media added to Plex, you can use either the Apple Remote or the cursor keys on your keyboard to navigate through the interface and play your music, movies, and television shows. The interface is beautifully designed and easy to use. The folks behind Plex have done a good job of hiding the complexity of the application behind the contextual menu (invoked by pressing and holding the Menu button on the Apple Remote for a second or two or hitting the ‘C’ key on the keyboard) and preventing it from spilling onto the main interface. If you want to do some things manually like editing the title of an item, marking it as watched or unwatched, scanning for new content, or adding an item to your favorites list, that contextual menu allows you to do it all and then some. One other great aspect of Plex is its newfound extensibility and integration with online sources for free content. Recent versions of Plex include the App Store, a built-in library of free third-party plugins that allow Plex to download content from websites like Apple Trailers, Hulu, Joost, Netflix, Pitchfork, Vimeo, and YouTube, which is just a tiny sampling of the rapidly growing library that consists of hundreds of such plug-ins. Combine this burgeoning library of plug-ins with the incredible pace at which new features are added to Plex itself and you’re looking at an application that has something new to offer almost on a daily basis. Plex’s beautifully designed interface makes it a breeze to navigate through and play music, movies, and television shows stored on your hard drive. Plex has almost completely replaced the combination of Front Row, iTunes, Perian, and QuickTime Player for me. It’s not just a great cataloguing and media center application; it does a stellar job of playing back media files as well. Very high definition videos, in particular, play smoothly in Plex, although they don’t in any of the aforementioned Apple programs, even with the Perian codecs installed. Plex is supported by an active community of developers and users, and new features are released on a weekly basis. Even with the abundance of features Plex already has, the developers assure me that there is much more to come—and I believe them. As great as it is though, there are a few features I would like to see added to Plex. The first one is more manual control over the tagging of media. Although Plex’s automated scraping of online databases is very reliable and does a great job nine times out of ten, there is always that odd video that just refuses to be identified correctly and you’d much rather fill in the details for it yourself. Also, you might have a series of videos that you want to corral into the television shows section, but you cannot do so in the current version of Plex’s library. One other feature that makes a lot of sense is a built-in theme browser (which may even be made a part of the App Store) that allows you to browse and download a variety of third-party themes for Plex and install them with a single click. As it currently stands, Plex’s default theme MediaStream is pretty much the only option for users. I would like to see this change and the Plex team’s emphasis on this area might bring about that change. If you have an even moderately large media library and like the idea of having everything neatly catalogued and readily available at the press of a button, or if you simply like watching high-definition movies, then you should try Plex. To see Plex in action, watch the video below (visit the Macworld YouTube channel to see the Plex video demonstration in HD).